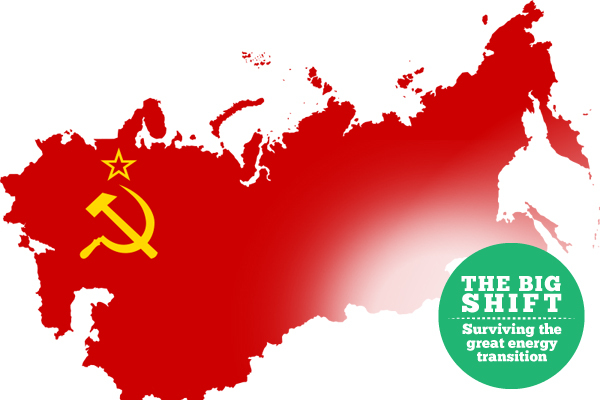 What Really Killed Soviet Union? Oil Shock? Red Empire just ran out of fuel, say growing number of experts. Empire fueled by oil: The reach of the Soviet Union before its fall. Can We Live again in 1964's Energy World? With the American economy teetering, Dmitry Orlov sees similarities in another 'superpower collapse.' Is he just a doomsayer? We should strive to play broker to China, Russia and the US. Communism and capitalism, two sides of a coin. Larry Hagman, the late U.S. actor that played the bombastic oilman JR Ewing, often quipped that the TV soap opera Dallas brought down the mighty Soviet Union. "The opulence, the consumerism, the food, the cars -- these things made them want more than their governments provided them," claimed Hagman. Academics, who had not foreseen or predicted the Soviet Union's rapid meltdown, now argue that the Reagan Doctrine probably forced the empire's demise. According to this theory, Moscow's inefficient centrally planned state just couldn't keep pace with U.S. military spending and went bankrupt. But that's not how Doug Reynolds and an increasing number of analysts now view the Soviet collapse. The 52-year-old U.S. economist, who taught energy economics in the Republic of Kazakhstan during the fall, says the Red Empire just ran out of fuel. With the official collapse of the Soviet Union in 1991, both North Korea and Cuba became energy orphans. The Soviet Union once shipped vast amounts of oil and fertilizer to both oil starved nations. In turn they exported their political allegiance and waves of anti-imperialist rhetoric. When this energy system fell apart, North Korea and Cuba suddenly became global laboratories for how nations might respond to peak oil or massive disruptions in oil deliveries, writes Oxford history professor Jorg Friedrichs. Their response is also a study in dramatic contrasts. North Korea's one per cent resorted to vicious repression coupled with nuclear threats while Cuba tapped into 19th century agricultural traditions and demonstrated much resilience. For decades North Korea used its Soviet oil subsidies to build a highly industrial agricultural system. In order to grow enough grain in an unseasonable climate, it heavily invested in machines and irrigation systems as well as cheap fertilizer to restore depleted soil resources. North Korea poured so many fossil fuels into its industrial farming system that the nation's per capita energy use in 1990 was twice that of China's, says Friedrichs. When oil imports stopped in 1991 along with cheap fertilizers, Korea's elites directed scarce fuel supplies towards the military and heavy industry, effectively starving agriculture. Korea's one per cent, in other words, saved fuel for tanks to defend the regime but not for tractors to feed its hungry peasants. While the Hermit Kingdom's well-fed rulers proclaimed a "Let's Eat Two Meals A Day" campaign, rice and corn production dropped by 50 per cent between 1991 and 1998. A calculated political famine then swept away nearly a million peasants or three to five per cent of the population. For ordinary people, the trains stopped and homes went cold in the dead of winter. Children grew thin and sick. North Korea's poor still live with recurring food shortages and a menu of endless political repression. North Korea survived economic collapse and the disappearance of cheap oil by investing its remaining energies in protecting the status quo and dabbling in nuclear experiments. As one observer noted, North Korea remains a land of two solitudes: "depressing poverty, pervasive food and medicine shortages, and crushing manual labour. Defending this grim reality is frightful military might in the form of ballistic missiles, hordes of armoured vehicles, long range artillery and one million soldiers." Or as Freidrichs concluded, "Korean-style totalitarian retrenchment is without doubt one possible response to a severe energy supply disruption." Cuba, however, replied much differently to a 70 per cent drop in oil imports, which precipitated massive wage losses and unemployment. Cuban economists compared the oil shock to an airplane falling from the sky and called it "the special period." Without Soviet oil, fertilizers and food imports, the caloric intake of most Cubans dropped from 2,600 to a lean 1,000 a day. In response, Cuba abandoned state-owned farming (the Soviet equivalent of agribusiness in North America) along with its attendant tobacco and sugar monocultures. Dire necessity and not "ecological consciousness" drove Cuba to develop the world's largest organic farming movement largely supported by the island's barrios or tightly knit neighbourhoods. People raised rabbits on rooftops and planted organic gardens on empty lots. Compost centres provided soil while traditional knowledge provided ways to combat pests with natural products instead of oil-based chemicals. So energy transitions driven by shortages can come with different political faces. North Korea's elites choose to starve its people and protect the powerful. In contrast, Cuba's rulers abandoned Soviet rhetoric and sought solutions among their own people and in a restoration of small farms and a relocalization of food markets. When oil production, and its all-important revenues peaked, the Soviet Union lost the energy mojo that glued its empire together. The empire's collapse was, in other words, another curious tale about energy transitions. The numbers alone are convincing. Soviet oil production dropped an astounding 50 per cent between 1988 and 1995 from 12 million barrels to seven million barrels. (Under Putin it has returned to 10-million barrels.) As oil drained from the Soviet machine, the nation's stability morphed into Russian chaos and a temporary political renewal. Satellites of the Soviet Union also went into energy descent. Deprived of cheap oil and subsidized fertilizers made from cheap natural gas, North Korea experienced a famine and Cuba fell into an economic and agricultural crisis known as "the Special Period." Now, Reynolds is no crank or gadfly. The energy economist, who also worked as a mechanical engineer in the U.S. military, teaches at the University of Alaska. In his view energy, not money, makes the world go around. He also believes that the Soviet collapse holds valuable lessons for every modern economy dependent on imported oil. The Soviet collapse, for example, demonstrates that "alternative energy technology has too little potential and takes too long to institute through an economy to be of any use during an oil crisis," says Reynolds. Nor is Reynolds the only thinker looking at the empire's failure from an energy looking glass. Yegor Gaidar, director of the Moscow-based Institute for Economies in Transition, argues that both oil and grain played key roles in the fall of the Communist empire. When flows of gold and silver to 16th century Spain dried up, it lost an entire empire. And when flows of oil and gas revenue dropped dramatically for the Soviet Union, it lost control over eastern Europe without "losing on the battlefield for 50 years." The fall of the Soviet Union, wrote Gaidar in a 2007 paper, "should serve as a lesson to those who construct policy based on the assumption that oil prices will remain perpetually high." Engineer, blogger and author Dmitry Orlov would mostly second that conclusion. He experienced the collapse first hand and attributes much of the chaos to peak oil. "The Communist regime was so corrupt and stealing as much as they could that they didn't pay attention to the system. It was on autopilot," said Orlov in a recent talk. Yet the story of how peak oil in a closed society precipitated the financial and geographical undoing of a major superpower remains a largely untold energy tale. Like the United States, Russia was a global oil pioneer in the 19th century. While U.S. entrepreneurs such as John D. Rockefeller turned Pennsylvania's black gold into a refining monopoly in the 1870s, Sweden's Nobel brothers (yes of that Nobel fame) put their straws into the fields of Baku in Azerbaijan. But the Soviet Union didn't really begin to spend its oil in a concentrated way until after the Second World War. That's when communists began to burn petroleum, well, like Americans by building cars, tractors, MIG jets and concrete cities. Just like U.S. petroleum joyriders, the Soviets also invested their oil surplus in Big Education (math and science), Big Medicine, Big Science (space programs) and a sprawling military-industrial complex. "The same things that worked for us in the United States worked for them," says Reynolds. "They had incentives and big bonuses. It wasn't a dead economy. It was a unified state economy." Oil, however, shackled the whole damn empire together. Cheap petroleum kept eastern Europe under communist control while oil export revenue paid for essential grain imports along with bottles of vodka for state elites. The union's oil abundance also saved it from two global oil price shocks in 1973 and 1981. Those volatile events sent most of the western world (including the United States) into recession, debt and as well as an ever increasing dependence on foreign oil. As oil prices rose in the 1980s, the Soviet Empire behaved like any incompetent petro-state: it pumped more oil to generate more revenue in order to build more infrastructure to consume more oil. It also wasted an enormous amount of petroleum, men and rubles in a vain attempt to conquer Afghanistan. At the same time it subsidized the energy needs of North Korea, eastern Europe and Cuba. Europeans of all stripes flocked to East Berlin to catch the cheapest flights to India in the 1980s and all thanks to Soviet fuel subsidies. But in the mid-1980s, Soviet oil production topped off at 12 million barrels a day due to poor management, old technology and lack of investment. And then oil production started to drop. As oil fields ran dry, the authorities spent more cash to coax more petroleum from aging reservoirs with massive water flooding programs. But these technological fixes didn't put much of a dent in the nation's oil depletion rates. 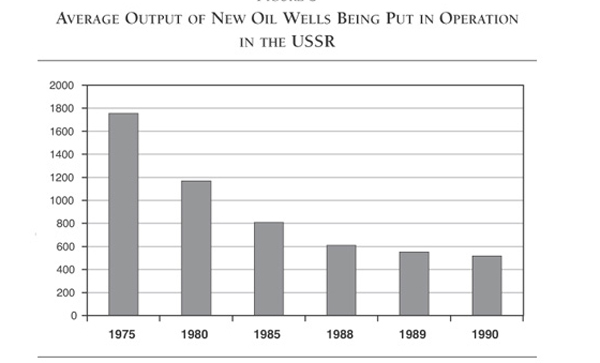 Just before Soviet oil production peaked in 1988 (the event walked hand in hand with a major drop in oil prices), the empire realized that it no longer had enough black gold to pay its bills. In full panic mode, "the dynamically developing world superpower" (as experts then called it) started to borrow heavily to prevent a bread famine due to oil-spending industrialization schemes that pushed 80 million farmers into Soviet slums. "But peak oil pushed the Soviet Union into an abyss," says Reynolds. To save oil for its own needs, Moscow even started to charge eastern Europe hard currency for its oil and at global prices. "Without the free oil, the eastern European economies went into a tailspin," says Reynolds. Shortly afterwards the whole Soviet machine disintegrated as well. So oil scarcity lead to debt, which feed an economic down turn (and lower GDP) that eventually resulted in currency devaluation along with a dramatic drop in oil consumption of 50 per cent from 1988 to 1995. "Oil production managed to go up as long as oil reserves were relatively abundant," wrote Reynolds in one paper. 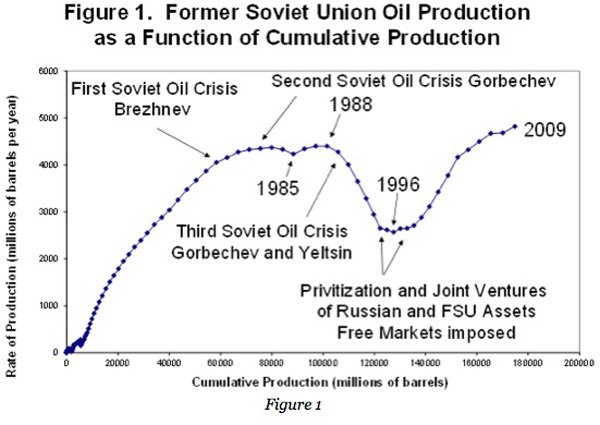 "However, once scarcity increased substantially, the communist system saw declining oil production which in turn could have caused their inefficient economic system to finally decline... They experienced peak oil in the system they had and they collapsed." To Reynolds the collapse of the Soviet Union offers a variety of disquieting lessons for the United States, Europe and Japan. All now face economic stagnation and rising debts associated with rising oil prices due to the depletion of light oil reserves around the world. The first lesson, says Reynolds, is that an oil price shock will stop an economy the same way an empty fuel tank will stall a car. "There are not a lot of substitutes for oil," says Reynolds. At the same time, big complex structures tend to fall apart when energy flows contract, adds Reynolds. The Soviet Union broke up; eastern Europe crumbled; and the Warsaw Pact dissolved as energy drained from the system like blood from a wound. Reynolds wonders if the European Economic Union and the United States can survive peak global oil without dissolving into smaller entities. Another hard lesson has to do with alternative energy sources. None could replace the power density and versatility of oil. The Soviets researched solar and wind but couldn't scale them up fast enough to make any difference during an oil shock. "Change is going to have to come from a collapse in energy demand. People will have to change their lifestyles." Fourth, free markets can play a role in revitalizing the energy sector. In response to the collapse Russia privatized its energy assets and added new technologies that temporarily revived oil production. But then Vladimir Putin nationalized the nation's oil wealth to consolidate his hold on power. Russia remains a petro-state dependent on its oil and gas revenues. But free markets did not change the nation's energy system by inviting more renewables or by encouraging sound energy conservation. "The former Soviet Union did not solve its energy crisis by using alternative energy, but by simply reducing its use of energy. This bodes badly for our own ability to depend on alternative energy," adds Reynolds. Last but not least, oil shocks promote social inequality. "The Russians had hyperinflation and massive unemployment. You also had the enrichment of the rich." To Reynolds, volatile and higher oil prices have thrust the world into an uncertain energy transition. "A likely road map for the future can be discerned by studying events before and after the collapse of the Soviet Union." Award-winning journalist Andrew Nikiforuk has been writing about the energy industry for two decades and is a contributing editor to The Tyee. Find his previous Tyee articles here. This special Tyee series was produced in collaboration with Tides Canada Initiatives Society (TCI). Funding was provided by Fossil Fuel Development Mitigation Fund of Tides Canada Foundation. All funders sign releases guaranteeing The Tyee full editorial autonomy. Tyee funders and TCI neither influence nor endorse the particular content of Tyee reporting.